I write-tested and tweaked 25 pens this morning and that’s enough for today. They have still to be photographed and described, but that’s for another day. 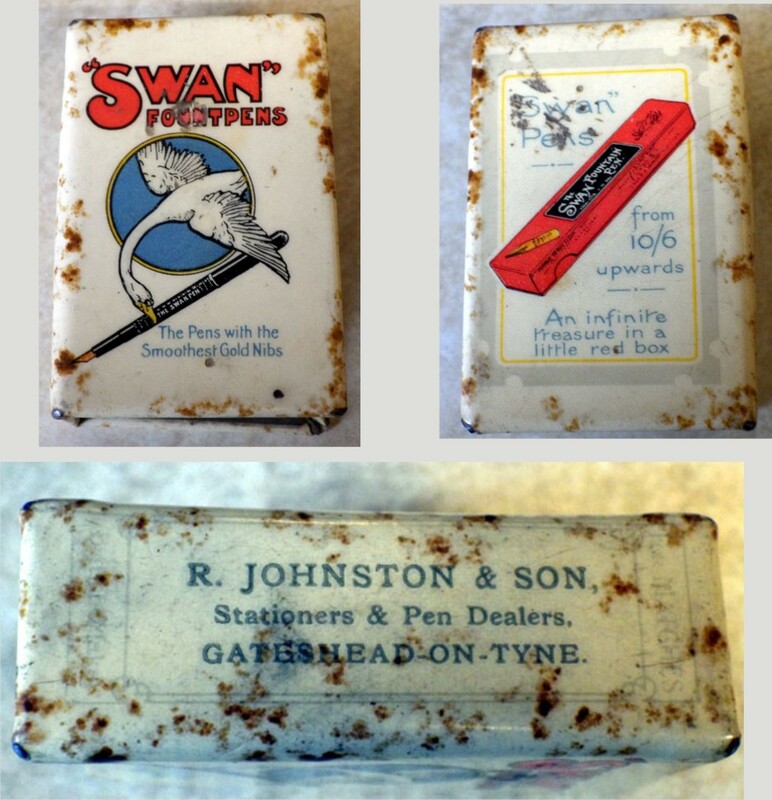 Here’s an unusual bit of Swaniana – a match-box cover. I don’t know why you’d need a cover for your match-box but it leaves us an interesting bit of ephemera. Looking at the pen and box illustrated I’d guess at the nineteen-twenties or earlier. As ever, Mabie Todd graphics are striking. The Swan reaches out of a circle which breaks the surface of the match-box cover to seize the pen. One wing is partly concealed by the surface of the cover, the other lies over it – an impossibility that is made to appear quite believable. The cover advertises Swan Fountpens. So far as I can remember I’ve only seen the term “Fountpen” used to refer to Blackbirds, so that’s something new for me. I can find no business information for R Johnston and Son, but they made (or had made) and sold picture postcards of the north-east of England, many of which survive and are collector’s items in their own right. Could it be these printers http://www.picturesofgateshead.co.uk/postcards_southtyneside2/ ? They made some really excellent black and white postcards which must be precious now for the changed landscapes and townscapes they depict. Robert Johnston, listed in my Kelly’s Directory of Stationers (etc), 1904, a Printer, Newsagent and Stationer, main address 27 West St., Gateshead, with another shop at 9 Trevelyan Terrace, Durham Road, Gateshead. No mention of the son in the Directory, so your cover is presumably later. A lovely piece of ephemera, just the sort of thing I like – is that something you are keeping or selling on? If the latter, I would be interested! Thanks for that, Andy. That’s the kind of thing that gives it a context. I probably will sell the match-box cover later on. My plan is to create (if I can) an ephemera/odds and ends section in the sales site and make some of these things available there. Re: “fountpen” – there’s a ghost sign on an old shop in Stoke Newington that proclaims “Fount pens repaired” http://www.ghostsigns.co.uk/2007/12/pulse-of-the-planet.html so it must have been a reasonably well understood term. That’s a super ghost sign and certainly makes the point about fount pens. Thanks a lot for that.